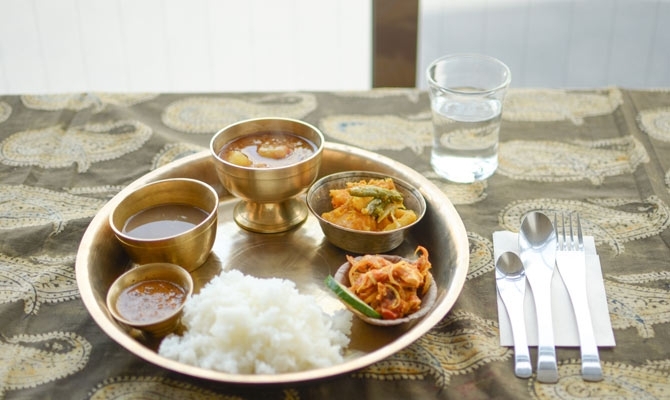 Dal bhat, or steamed rice with a lentil soup, is a traditional Nepalese dish. Even if we don’t always remember the history behind the Colosseum, the significance of the Great Pyramids’ configuration, or who built Machu Picchu after returning home from a trip, we can almost always remember what we ate while we were there. Of course, food memories can range from pleasurable to uncomfortable or even mediocre. Judgments aside, though, most of us travelers can agree that the times when we eat during a trip are most often also the times when we feel the most engaged. With all five senses stimulated, we not only see, hear, smell, or even touch a certain place — we taste it, too. Globalization has made sampling delicacies from around the world fairly easy. Most of us don’t have to live in the Middle East to sample delicious falafel, or travel to China for near perfect jiaozi. But our list isn’t solely about individual dishes; it’s about the experience of eating in an authentic context. It’s about actually stepping foot in the wood-fired pizza ovens in Naples, the steaming noodle shops of Tokyo, and the bustling cevicherias of Lima. You may be able to recreate a crêpe, but you (sadly) will have a difficult time recreating the crepêrie that wafts saccharine batter aromas from a Parisian street corner. None of these dishes could have been created in a vacuum. They are most often the sum of geography, traditions, necessities, and personal tastes of a given culture. This considered, many of the dishes on our list arguably have multiple homes across several borders, yet we’ve chosen to bring you the locations where we believe you can find them in some of their purest forms. In the following five slideshows, we’ve rounded up 150 different foods that enhance the experience of a given place. Not only do these foods complement a trip, some might argue (as we do) that given the proper address, they’re worth the trip themselves. Our journey through the world’s most iconic dishes begins in the Middle East and Africa. Some of the dishes in this area maybe be more familiar to you than others (hummus versus poulet nyembwe, for example), with names that you may or may not be able to pronounce. Ranging from origins in Algeria to Yemen, the majority of these dishes in our list are rich with with pungent spices, hearty grains, and stewed vegetables. Next, we head east to Asia, where we honor some popular dishes like Chinese peking duck, sushi, and kimchi, as well as lesser-known delicacies like khao soi and adobo. A little further south, the Pacific region has hearty Austrailian meat pies and New Zealand’s meringue-based Pavlova. A mash-up of both the familiar and more exotic, this lineup is only the beginning when discovering this region’s vibrant culinary culture. Our Europe and United Kingdom selection is a dense and delicious mix, with highlights spanning culinary capitals from Austria to Northern Ireland. Some of the more familiar dishes on this list include pizza and fish and chips, while generally lesser-known dishes like colcannon and cevapcici, are also reconginized for their cultural importance. Whether or not you’ve got your own Eurotrip planned in the near future, our roundup is the next best thing to being there yourself. Although you might assume this list might be the most familiar, certain delicacies that we’ve included from this part of the world could surprise you. In addition to hamburgers and hot dogs, North America is also home to conch and ropa vieja. This slideshow spans from Trinidad and Tobago to Canada, while encompassing Old and New World culinary cultures, as well as a spectrum of climates and ingredients. Just because you may have tried some of these dishes, don’t assume that you know them all. Spanning the entire continent, this leg of our roundup includes many meat-centric dishes and traditions from the region, including Argentina’s parrillada and Brazil’s feijoada. Lighter dishes, including Peru’s ceviche, are included here, too, alongside potentially less familiar selections that generally incorporate rich grains and a variety of beans. Did we forget an essential dish in one of your favorite travel destinations? Let us know by leaving a comment. To see our complete list of 150 foods worth traveling for, go to the next page! Caroline Brown, Emily Kolars, Emily Rothkrug, and Meredith Whitman contributed research and reporting to this article.